Well, I arrived at court in the morning and we listened for a few hours to more evidence and were told that we have to reach a decision. Anyway, it was complicated and not everyone agreed but in the end we did. Don't know what I am allowed and what I am not allowed to say, so I won't put it here! I have to say, if I am called for Jury service again, I will defiantly do it. It is a very good experience and if you are called, it is hard but very good work. Just a little tip - Bring a laptop or something interesting to do... It is so boring if you don't! Another half day! The case is going on for quite a while and is very complicated and interesting. Anyway, we have been told that it will end tomorrow and to bring lunch as we will not be allowed out until we reach a decision. I have finally been picked! I have been so bored that I decided to bring my laptop in and of course, it has to be no more than 5 minutes after I set it up, I am called! I went in to the waiting area then in to the court room and out of the 15, I was called! Not allowed to discuss the case, but we had about a hour in court then were told to go home as the Judge had other things booked for the court room that afternoon. Jury service is so boring! I am not going to write about every day because quite frankly - NOTHING HAPPENED! I can not explain how boring it all is. I brought a few books and my Nintendo to play, however it was so boring there, I just could not concentrate! I kept looking at my watch every few mins and just wished it could end. I am starting to talk to a few people and make friends... Feels sort of like you are being thrown in to Big Brother! All people who you barely have anything in common with. Anyway... I hope I get selected for something soon, some people have been called for 3 or 4 trials whilst I haven't been on one! 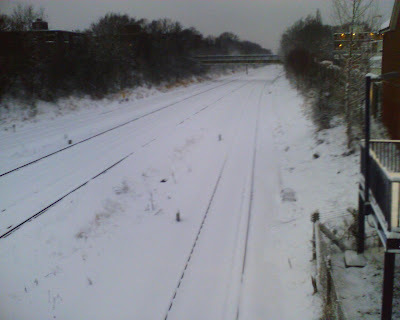 The snow is still everywhere but as the trains are running (just about) I made my way in for Jury Service. and... It's my birthday! I must be getting older now as I just feel like I couldn't care less! Anyway, it was so boring, words really can not describe it. I was not picked at all! Well, I got out of bed and the snow was still very bad. I heard that there were no trains again so I rang the telephone number and was told again that they are not expecting anyone to come in. Well, I woke up early as I had to go to Croydon Crown court for my first day of Jury Service. The TV News and the radio was surprisingly unhelpful as they said some train services are working and all the websites and phone lines were completely overloaded! I thought I better take a picture just in case I needed proof for not attending Jury service. When I got home, I rang the Jury service telephone number but could not get through! I kept retrying and when I finally did the Woman just said everyone is ringing and Jury Service is off for the day! I went to London for the Chinese new year with my brother and dad. When we got there, I took a look around all the stalls but found nothing really worth buying (apart from a 50p small dragon expanding paper toy!). We managed to find a place in Leicester Square to stand for the fireworks and it was amazing! There was not really any traditional rockets, just many firecrackers / bangers. My ears were ringing as there had to be many thousand bangs! I really cannot describe it other than brilliant! When it was over, we went through all the crowds to try and find a restaurant to eat at. There was a usual argument between me and Edward on where to eat, but there was one place that looked really good, from the front door there was quite a long walk and a bridge to walk over a pond. Anyway, they were fully booked and we were turned away. It must of taken about 30 minutes of walking around to find another restaurant that had space. It started snowing as we were going in. We found one place called Lido. The food was quite quick, it wasn't that bad but the staff were so unfriendly and rude. When we had finished the meal, we started to go home and none of us could believe how much the snow had settled! It was snowing so heavy that even when moving around, it was settling on my coat within seconds! We got to the underground station and started the LONG journey home. When we got to Charring Cross, we were told that there were no direct trains due to Signal problems but if we take a train to Lewisham, we should be able to get a connection there. 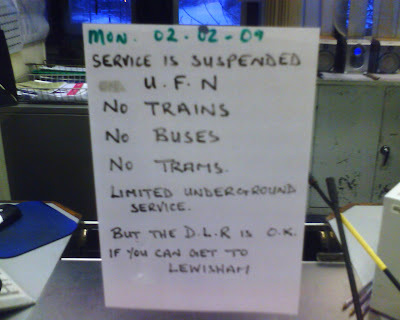 When we got to Lewisham, well, It was the new end of the line! Notihng was going out of there and it looks like we were on the last train. 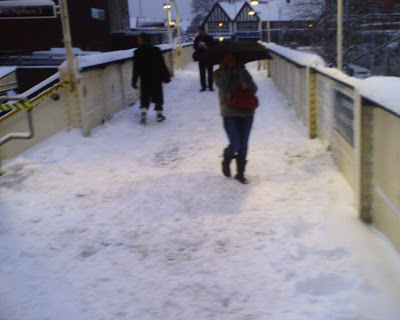 We were at Lewisham station for at least 2 hours and it freezing! 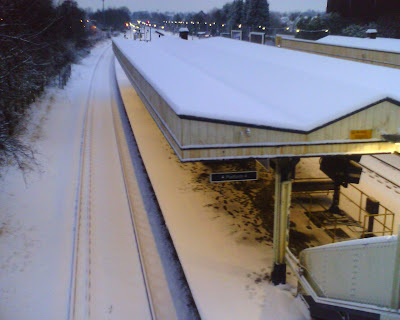 The snow was not really that noticeable at the station and we thought the worst of it was when we came out the restaurant earlier in the night (how wrong we were!). It was a bit slippery and in the corners of buildings you could see ice, but that was about it. The bus was going ok, and then when we went past the Quasar building in Bromley road, suddently everything changed! This is a picture just after someone got off the bus! 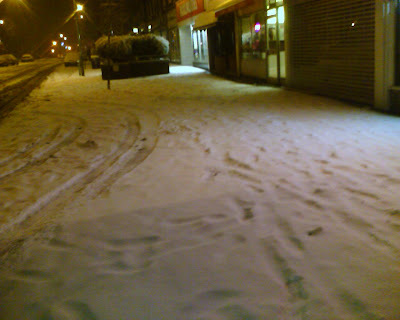 The snow was so thick that it compressed under your feet well before touching the pavement! Going just past Bromley south station, the bus could barely get up the hill! but we are really lucky it did as apparently the service was suspended not that long after as other drivers were refusing to go up the slippery hill! When I got in, I took my dogs on a walk around the block which probably was not a good idea! They both loved the snow but whilst one was completely fine and just shock the snow off, the snow just stuck like glue to the other dog! I have never seen anything like that :S I had to use a hairdryer to melt it as it would just not come off. 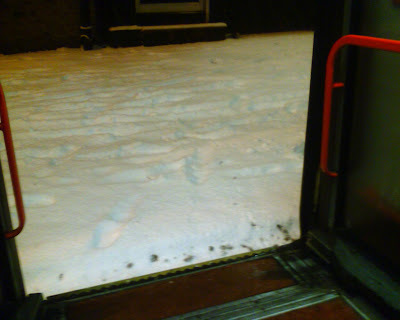 Anyway, we were all glad to be home as if we had not caught the last train or bus, I am not sure what we would of done! I went to sleep shortly after as I had Jury service in the morning!